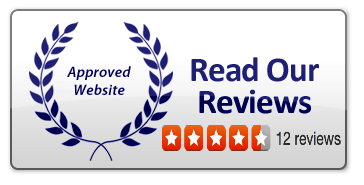 Air Conditioning Excellence, Inc. helps you stay cool and comfortable with quality Commercial AC Coil Cleaning Ft Lauderdale. An air conditioning system has two coils--condenser coils and evaporator coils--usually made of copper tubes with aluminum fins. The evaporator coil, or indoor coil, is often described as the "cold" coil because it provides indoor cooling. The coil works by absorbing heat from the indoor air that is blown over by the air handler's fan. The condenser coil or outdoor coil is the "warm" coil as it rejects the heat as a fan blows outside air over the surface. Coils are found in refrigeration equipment including those used in supermarkets and restaurants. It's not uncommon to find hundreds of "through-the-wall" fan coil units in a hotel, dormitory, or apartment building. As the air moving over the coils contains dust, dirt, pollen, moisture and other contaminants, the coils get dirty and become less efficient. In addition, the evaporator coil and its condensate pan can become fouled with pollen, mold spores that can have adverse effects on indoor air quality. If not maintained, the moisture around the evaporator coil can become a breeding ground for bacteria and mold. That's when you need to call a professional AC Coil Cleaning Ft Lauderdale service like Air Conditioning Excellence, Inc.
A coil filled with dirt and grime cannot supply proper heat transfer, and thus results in greater energy consumption. Equipment operating with dirty coils can use up to 37% more energy than those with clean coils. Additionally, a dirty system’s cooling capacity can be reduced by as much as 30%. Dirty coils increase operating pressure and temperatures that breakdown the compressor’s lubricant and can result in equipment failure. A failed compressor means no cooling and costly repair. A Commercial AC Coil Cleaning Fort Lauderdale program should be instituted when the coils are new and clean, and should be performed with a frequency sufficient to prevent deterioration of the coils. This can be as often as four times a year (monthly cleaning is reported in some areas). If they do not already exist, install easy-to-open panels to gain access to the coils. This will make the job much easier and consequently, the more likely to be done when coil cleaning is necessary. If the coil is contaminated with a light dust or dirt not adhered to the fins, blowing low-pressure compressed air across the fins or the use of a soft bristle brush may be sufficient. Applying a plain water or mild detergent solution to the surface, allowing it to sit for a short time then rinsing is employed in some cases. More aggressive deposits call for the use of stronger cleaning solutions or solvents. Coils can be steam-cleaned but require extra care. Steam must be applied at low pressure and the stream kept parallel to the fins to prevent folding the fins over. Another popular coil cleaning method employs the use of a garden-type pump sprayer to apply foaming chemical to the coil surfaces. The foam is allowed to dwell on the surface to saturate the fins. The foam is then vacuumed up and the process repeated. Finally, the coil is rinsed with clean water from a hose. Perhaps the most popular cleaning method used in recent years is using pressure washers to clean coils. Pressure cleaning coils may increase airborne Macromolecular Organic Dust which must be contained to the area being cleaned. Pressure cleaning should be done in the opposite direction of air flow through the coil. A cleaning solution can be applied before the pressure rinse using the built in chemical injection system on the pressure washer or a hand sprayer. Care must be taken when using a pressure washer to avoid damaging the fins on the tubes. Water leaving the coil should be free of particulate. If it is not, repeat the process. In many commercial buildings, evaporator coils are located in difficult-to-access areas, so effective cleaning and sanitizing of the coils requires the right expertise and equipment. 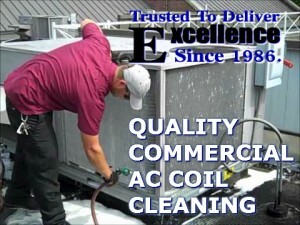 Our Commercial AC Coil Cleaning Ft Lauderdale technicians have the experience to perform a thorough cleaning that will leave your system in an almost-new condition, restored to peak operating condition. By following up with regular cleaning and replacement of filters, coil cleanliness can be maintained, keeping your system running smoothly and efficiently on even the hottest summer days.